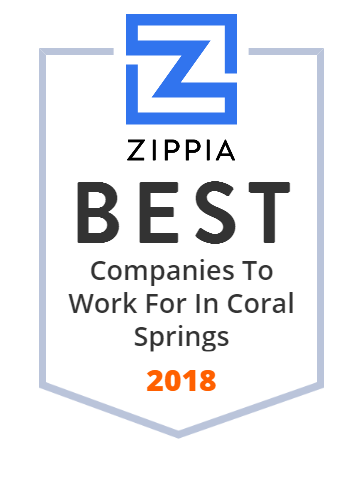 We hand-curated a list of the best companies to work for headquartered in and around Coral Springs, FL using data on salaries, company financial health, and employee diversity. The premier optical industry platform, delivering tailored business solutions and world-class customer service to eye care practitioners. Centerline Homes is a leading home builder and developer in Florida. The company's success is based on the philosophy to build innovative homes in prime locations to meet the needs of today's buyers. Founded in 1993, Centerline Homes continues to provide beautiful homes with artistic design and superior architectural detailing. Over 5,000 families have trusted Centerline Homes to build their dream house and the number is still growing. Since 1985, Inter State Security has been providing clients in Dade, Broward and Palm Beach counties in Florida with security services. It supplies highest quality security officers, concierges, marked patrol vehicles, roving officers and has a Tactical Elite Division for extreme conditions. The company also offers an array of equipment, computers systems, DVR Camera Systems, Burglar and Fire alarms, telephone entry systems, and more. All of its personnel are licensed by the State of Florida and went through on-the-job training. KB Electronics manufactures over 200 models of digital and hybrid AC drives (AC inverters), variable speed DC motor controls, battery DC-to-DC controls, brushless DC drives and Triac fan controls. Its controls and drives are used in air moving devices, conveyors, door and gate openers, misting pumps, and other applications. Founded in 1967 in Brooklyn, NY, the company later moved its headquarters to Coral Springs, Florida, in 1995. The KB Electronics brand was acquired by Nidec Motor Corporation in 2015. TekPartners is a full-service organization that offers consulting, staff augmentation, recruitment, and human capital solutions to its clients. It focuses on the areas of Application Development, Data Warehousing, Database Administration, Web Development, Network Infrastructure, ERP, Business Analysis, Project Management and Technical Support, and aims to provide its clients the ability to select and hire the best and most qualified talent in the marketplace. Headquarted in Coral Springs, FL, TekPartners has additional offices in Charlotte, NC; Milwaukee, WI; Orlando, FL; Fort Lauderdale, FL. Air Around the Clock 's AC Repair and AC Service provides air conditioning, cooling and HVAC repair, air conditioner service and maintenance programs. With 120 radio-dispatched ATC air conditioning vehicles on the road, Air Around the Clock continues to offer high quality professional services to the residents of South Florida. Its full-time technicians provides air conditioning, HVAC, refrigeration service, installation and maintenance. The company's main office is located in Sunrise, FL, and its north office is in Palm City, FL. Since 1995, Stewart Supply has been specializing in industrial supplies and focusing on customer service and customer satisfaction. It offers competitive prices on products and brands needed by its customers, ensuring that it stands out from its competition. Stewart Supply is dedicated to ensuring that every order is served correctly. Arbitration Resolution Services, Inc. (ARS) was created to revolutionize the way disputes are resolved throughout the country. By integrating state-of-the-art technology with experienced and knowledgeable professionals, ARS has developed the ideal environment to bring alternative dispute resolution, using mediation and binding arbitration, to virtually everyone, anywhere in the country. It is the world's finest cloud-based alternative dispute resolution (ADR) provider where the entire process can be completed online. Ambient Healthcare, Inc., a specialty pharmacy and infusion company, provides health therapy to patients in the home, medical center, physician office, skilled nursing facility, or other selected health care sites. The company s services include supply of various supplies to facilitate the infusion and maintenance of prescribed therapies; and ambulatory and elastomeric pumps for patients with precision infusion needs. It also offers pharmacy managed therapy services, including antibiotics, antiemetics, chemotherapy, internal nutrition, HIV therapy, human growth hormone, hydration, inotropics, IVIG, oral medications, systemic drug aerosols, total parenteral nutrition, and factor products. In addition, the company offers patient and clinical services, such as specialty pharmacies, pharmacokinetics, clinical monitoring, pain and case management, nutrition consults, Hi-Tech infusion nursing, patient education, insurance authorization, and home delivery. Further, it offers clinical management and pharmacy disease management programs to help educate the patient on the proper use of medications. The company was founded in 1996 and is based in Davie, Florida. It has pharmacy locations in Davie, Tampa, Orlando, Jacksonville, and Pensacola, Florida; Marietta, Columbus, and Augusta, Georgia; North Charleston, South Carolina; Huntsville, Tuscaloosa, and Mobile, Alabama; and Winston-Salem, North Carolina. Ambient Healthcare, Inc. operates as a subsidiary of Ambient Holdings, Inc. Incorporated in 1989, The Siebold Company Inc. (TSC) is national electromechanical installation contractor that specializes in material handling equipment installations. The company's mission has evolved into providing a full complement of services that include mechanical installation, electrical installation, demolition, system reconfiguration, system relocation, project management and engineering management. It is guided by its goal to successfully manage and complete electromechanical installations for their customers, be it on time or ahead of schedule.